Jumbo inflatable black pvc vinyl cauldron cooler is ghoulishly great for any haunted event! Perfect for classic fun apple bobbing, serving soda pop and beer cans and drink bottles over ice, trick-or-treat candy bowls, deadly floral arrangements, zombie body parts display, Halloween haunted house witch props and more! Giant cauldron inflates to approx. 22-inch (55cm) diameter and 15.5-inch (38.75cm) high. Holds approx. 48 12-ounce cans. 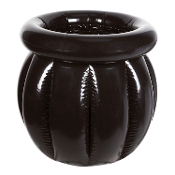 Put this wild inflatable black cauldron on your buffet table or on the floor and fill with ice and whatever food and beverages need to be kept cool. Why not get more than one, fill them with beverages and other decor and scatter them around your house!